It is an avant-garde reinterpretation of the iconic TAG Heuer Carrera. It was on the advice of his 18-year-old son that watch industry icon Jean-Claude Biver decided to embark on a collaboration with Hiroshi Fujiwara — musician, influencer, god-father of Japanese streetwear and founder of fashion label Fragment. Biver was of the belief that one must listen to millennials for ideas and lessons. “He told me that we should do a watch with Fujiwara, and that this watch would be so successful it would be incredible. So, I said okay,” he explained. 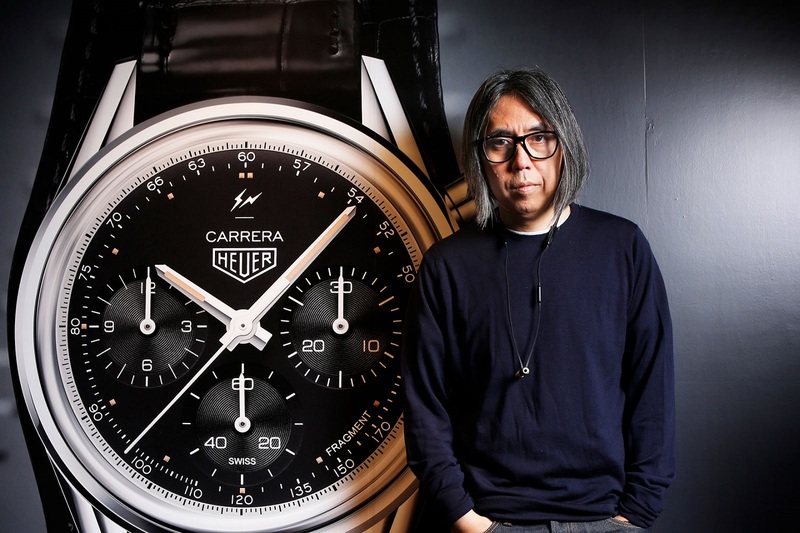 Fast-forward past a meeting in Japan with the said streetwear guru and we have the launch of the TAG Heuer Carrera Heuer 02 by Fragment Hiroshi Fujiwara. “This is the first watch that I had nothing to do, nothing to change and nothing to comment. Normally, we tell our designer what we want. But do you say anything when you have the best designer? No, you shut up, sleep and wait and see what he has done for us,” Biver said. alligator strap and an unusual black-and-grey Nato strap. Before the press conference, we got to chat with Biver and Fujiwara. As a collector of vintage sports watches from Rolex and Patek Philippe, Fujiwara was immediately drawn to the Carrera. “I think it is good because they don’t really do this size and they don’t really look back at the vintage watches much, so I brought back the smaller vintage watch. I think nobody has done it,” he said. Size played a key role in Fujiwara’s decision. “TAG Heuer does big modern sports watches, so I never really thought I would wear it. I knew the vintage one was really small and nice,” he added. The new 39mm Carrera 02 has a black opaline dial featuring three matching chronograph counters with lacquered white hands and a Fragment inscription at 4 o’clock. Contained within a polished stainless-steel case and bezel, the watch has a tachymeter scale on the periphery and a sleek, silvery-white inner flange with seconds. This sporty timepiece has a domed “glass-box” sapphire crystal with double anti-reflective treatment as well as a sapphire caseback. Complete with faceted beige Super-LumiNova hour and minute hands along with matching indices, this watch has an 80-hour power reserve. Fujiwara’s design is understated, with a young and vibrant attitude all its own. Having such an impact on streetwear, he said punk rock music from 1977 heavily influenced him. “It was amazing and never seen before. Like music and fashion were together … It was really interesting,” he added. Prior to this, Fujiwara has collaborations with famed brands such as Nike, Levi’s, Supreme, Louis Vuitton and many more. He has even worked with celebrated musician Eric Clapton. Fujiwara works closely with a lot of young people, inadvertently giving them valuable experience and exposure. “I don’t really think I’m helping younger people, they are just interesting … I just want to work with interesting people. Some know better than me in other categories,” he said. While in Tokyo, I had the opportunity to visit Fujiwara’s Conveni store, a temporary pop-up shop in Ginza Sony Park. Designed to look like a supermarket with fridges and magazine racks, this fun concept store sells designer items in an ordinary setting. Most of the products are not what they seem: water bottles containing T-shirts, drink cans with reusable bags and what looks like a carton of eggs are actually bath bombs. “Conveni [Japanese slang for convenience stores] in Japan is really different from the convenience stores in the US or London. I love Japanese conveni and I was always thinking of putting in the luxury that I make in a kind of conveni concept. So I just try. And customers really love it,” explained Fujiwara. Before the unveiling of the Carrera, I had the chance to visit one of TAG Heuer’s other boutiques in Ginza. It was the first store to have unique visual merchandising displays installed, which also made an appearance at Baselworld 2018. Made up of three floors, the Ginza boutique’s high tech, revolving displays allow customers to easily try on watches and read the specs with the help of a touch screen. Using an app, you can also save the necessary details to later make a purchase online, paving the way for TAG Heuer to be a market leader in the digital age. If you missed out on TAG Heuer’s new Carrera, you can look forward to another Fujiwara collaboration, which should be unveiled sometime this year. “I will still do a sports watch but a kind of new interesting piece. It’s going to be of a different shape and a different size,” Fujiwara revealed. This article first appeared on Jan 7, 2018 in The Edge Malaysia.